Prepare for the top interview questions you can expect in your job interview. 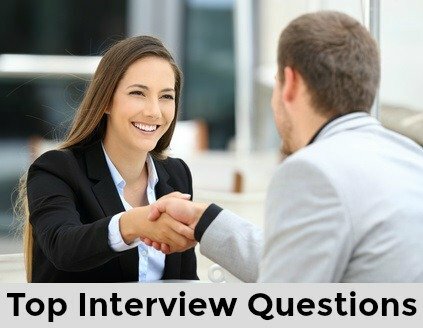 Use the sample interview answers to be ready with winning interview answers to these frequently asked interview questions. Good preparation is the key to interview success. The interviewer wants to find out if you have a good understanding of how you are perceived and how your behavior impacts on others. Your self-insight and your relationship with your co-workers are both being evaluated with this interview question. Your interview answer should demonstrate an objective view of your strengths and areas for improvement in terms of teamwork, communication and your interpersonal skills. In your job interview answer describe the good points and perceptions but also discuss one or two areas that you are aware need attention. Emphasize what you have done to improve on these areas. This makes your answer both real and insightful. When you refer to the positive characteristics, support your answer with a quote or paraphrase from one or two of your colleagues. "I know they consider me to be hard working. In fact, the other team members often thanked me for the extra hours I put in." Then move on to the areas for improvement. "I know that I was initially considered intolerant if I felt they were not putting in the same amount of effort as I was. I realized it was better to encourage them to meet our deadlines by offering help where needed. This has worked much better for all of us." Use work-relevant competencies like good communicator, reliable, decisive, resilient, energetic, team member when answering top interview questions like this. This is a personal trait, there is no right or wrong answer. However, you need to prepare for this job interview question and note down some specific examples. It is often difficult to verbalize your motivation properly in the stressful context of a job interview. Other interview questions will determine whether you have the skills for the job to answer the question Can you do the job? With this question the interviewer is exploring whether you will be a good motivational fit with the job opportunity to find out Will you want to do this job? What does motivate you will depend on your background and work experiences, but try to make your motivation relevant to what this job can provide. For example if the job is a fairly isolated one do not give "working with other people" as a motivation. You can actually use this preparation as an opportunity to think about whether this position is really suitable for you in terms of motivational fit. "I am motivated by the challenge of difficult tasks and projects.My previous manager gave me more and more responsibility as I proved myself, I found this very motivating." "It is important for me to meet the customers needs. I give them the best service and when I exceed their expectations or get positive feedback it motivates me." "I like to know that I am growing as an employee. Learning and using new skills is a big motivator for me." Review the job tasks and requirements to determine the motivators that will be present in the job you are interviewing for. Make your answer relevant to the job opportunity and the company. Find out how to answer interview questions that ask you to describe your ideal job. View top interview questions and answers that explore what interests you most in the job. What are the key skills for this job?